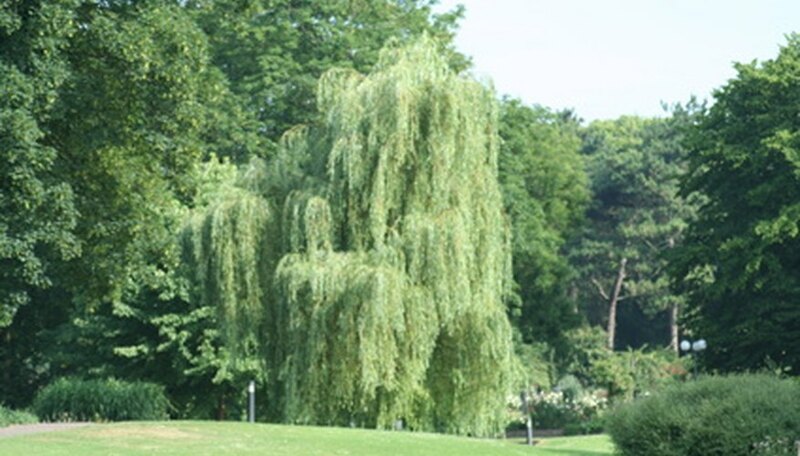 The weeping willow is a beautiful, graceful tree much prized for its contributions to the landscape of any home. But they also have many problems, and they tend to be disease-prone. The best way to keep your weeping willow happy and healthy for many years is to be aware of weeping willow diseases and symptoms so that you can spot and avert problems early. Willow scab is a fungal infection that enters the tree through twigs. The first signs will be yellowing, stunted leaves. Left unchecked, willow scab will turn the twigs black and cause defoliation. You can spot willow scab by looking at the underside of the leaves: If your tree is infected, you will see olive-green masses of spores alongside the veins. You can contain willow scab--and its "partner in crime," black canker (Physalospora miyabeana), which causes cankers on affected branches--by using sterile pruning to remove impacted areas of the tree. Alone, willow scab can make your willow tree very sick or black canker can create serious cosmetic problems. Together, these two viruses cause willow blight, which is typified all the symptoms of both fungal infections: cankers, stunted leaves, blackened branches and defoliation. Willow blight can kill your willow tree if you do not quickly remove and dispose of impacted foliage and limbs. Powdery mildew causes a black, gray, white or pinkish dusty coating to form on leaves and branches of the willow tree. Generally, it is largely a cosmetic problem, but left unchecked, it can weaken your tree and allow a secondary infection. Powdery mildew infections can usually be controlled using sterile pruning techniques, but if that doesn't work, you can treat the tree with a fungicide to remove the problem. Willow leaf spot diseases start out with the formation of small, black spots on existing leaves. Left unchecked, the infection will spread and the spots will get bigger, eventually rotting the leaves or causing them to yellow. Over time, the leaves will fall off the tree and new, stunted and deformed leaves will grow that will age and fall far too quickly, placing strain on the tree. Willow leaf spot is caused by a fungal infection and usually can be controlled with sterile pruning and carefully disposing of infected debris. But if these efforts are inadequate, you can treat the tree with a fungicide to eliminate the problem.